Former telecom minister A Raja, DMK MP Kanimozhi and all other accused were recently acquitted by a special court in the 2G spectrum scam case. NEW DELHI: The Congress today alleged that the 2G case was a "conspiracy" wherein an entire campaign of "insinuations and calumny" was systematically built to tarnish the UPA government, and sought an apology from the BJP. 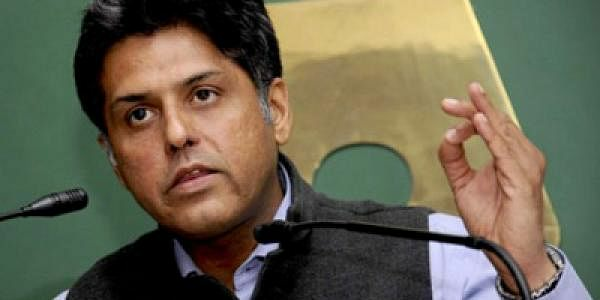 Congress spokesperson Manish Tewari hit out at former comptroller and auditor general (CAG) Vinod Rai, alleging that all the other CAG reports during his tenure were "figments of imagination", which were specifically designed to vitiate the atmosphere. "There were a series of such reports which were put in the public space between 2010 and 2013. And subsequently, when the government changed, the author of those reports was rewarded with very high positions during the current NDA dispensation. "One thing which very clearly emerges that there was a conspiracy whereby an architecture of untruth and entire campaign of insinuations and calumny was systematically built in order to tarnish the image of the then UPA government," he told reporters. "One thing very clearly emerges that even all the other CAG reports, which were tabled during the tenure of Vinod Rai were figments of imagination, were specifically designed to vitiate the atmosphere and they need to be consigned to the dustbin of history," he said. He said, "It also emerges that those people, especially the BJP, which used this 'architecture of untruth' in order to wipe out Parliament session after Parliament session, in order to create an entire campaign of lies across the country, they need to apologise." Tewari said acquittals in the 2G cases have focused attention on a very critical aspect which is the efficacy of CAG report which were formulated during the time when Vinod Rai was heading it. The entire process which ultimately led to the filing of criminal cases, charge-sheeting of various people commenced when the CAG threw those very sensational numbers and a presumptive loss of 1.76 lakh crore. "And the irony is that the CAG report which completely vitiated the atmosphere, ruined reputations, demolished careers, that CAG report was not even a relied upon document by the prosecution during the 2G trial," he said. He said the trial court judgement and irrespective of what the BJP may claim, the fact is that the trial scrutinised 3-4 lakh pages of documents, it sat for seven long years, heard the prosecution and defence witnesses and finally after sifting through a mountain of material, it came to the conclusion that there was no case. "In fact, the strictures which have been passed by the judge are extremely damning that a set of patch was artfully arranged in order to given an impression that there was a scam, when there was not at the first place," he added.